Much of my writing is focused on the real-world impact of government policy, and this is why I repeatedly look at the relative economic performance of big government jurisdictions and small government jurisdictions. But I don’t just highlight differences between nations. Yes, it’s educational to look at North Korea vs. South Korea or Chile vs. Venezuela vs. Argentina, but I also think you can learn a lot by looking at what’s happening with different states in America. So we’ve looked at high-tax states that are languishing, such as California and Illinois, and compared them to zero-income-tax states such as Texas. With this in mind, you can understand that I was intrigued to see that even the establishment media is noticing that Texas is out-pacing the rest of the nation. Here are some excerpts from a report by CNN Money on rapid population growth in Texas. More Americans moved to Texas in recent years than any other state: A net gain of more than 387,000 in the latest Census for 2013. …Five Texas cities — Austin, Houston, San Antonio, Dallas and Fort Worth — were among the top 20 fastest growing large metro areas. Some smaller Texas metro areas grew even faster. In oil-rich Odessa, the population grew 3.3% and nearby Midland recorded a 3% gain. But why is the population growing? Well, CNN Money points out that low housing prices and jobs are big reasons. And on the issue of housing, the article does acknowledge the role of “easy regulations” that enable new home construction. But on the topic of jobs, the piece contains some good data on employment growth, but no mention of policy. Jobs is the No. 1 reason for population moves, with affordable housing a close second. …Jobs are plentiful in Austin, where the unemployment rate is just 4.6%. Moody’s Analytics projects job growth to average 4% a year through 2015. Just as important, many jobs there are well paid: The median income of more than $75,000 is nearly 20% higher than the national median. That’s it. Read the entire article if you don’t believe me, but the reporter was able to write a complete article about the booming economy in Texas without mentioning – not even once – that there’s no state income tax. But that wasn’t the only omission. The article doesn’t mention that Texas is the 4th-best state in the Tax Foundation’s ranking of state and local tax burdens. The article doesn’t mention that Texas was the least oppressive state in the Texas Public Policy Foundation’s Soft Tyranny Index. The article doesn’t mention that Texas was ranked #20 in a study of the overall fiscal condition of the 50 states. The article doesn’t mention that Texas is in 4th place in a combined ranking of economic freedom in U.S. state and Canadian provinces. The article doesn’t mention that Texas was ranked #11 in the Tax Foundation’s State Business Tax Climate Index. The article doesn’t mention that Texas is in 14th place in the Mercatus ranking of overall freedom for the 50 states (and in 10th place for fiscal freedom). By the way, I’m not trying to argue that Texas is the best state. Indeed, it only got the top ranking in one of the measures cited above. My point, instead, is simply to note that it takes willful blindness to write about the strong population growth and job performance of Texas without making at least a passing reference to the fact that it is a low-tax, pro-market state. At least compared to other states. And especially compared to the high-tax states that are stagnating. 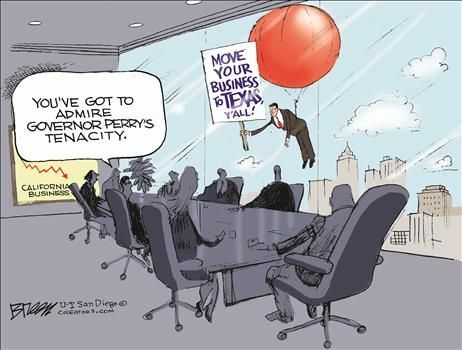 Such as California, as illustrated by this data and this data, as well as this Lisa Benson cartoon. 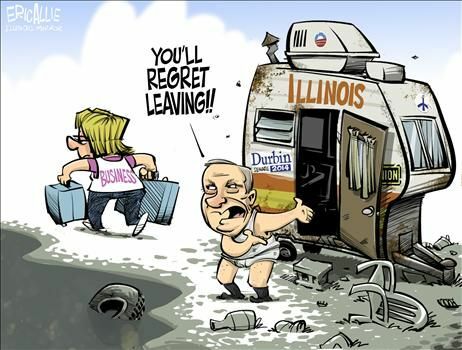 Such as Illinois, as illustrated by this data and this Eric Allie cartoon. And I can’t resist adding this Steve Breen cartoon, if for no other reason that it reminds me of another one of his cartoons that I shared last year. Speaking of humor, this Chuck Asay cartoon speculates on how future archaeologists will view California. And this joke about Texas, California, and a coyote is among my most-viewed blog posts. All jokes aside, I want to reiterate what I wrote above. Texas is far from perfect. There’s too much government in the Lone Star state. It’s only a success story when compared to California. P.S. Paul Krugman has tried to defend California, which has made him an easy target. I debunked him earlier this year, and I also linked to a superb Kevin Williamson takedown of Krugman at the bottom of this post. P.P.S. Once again, I repeat the two-part challenge I’ve issued to the left. I’ll be happy if any statists can successfully respond to just one of the two questions I posed. Whom ever wrote about the low cost of housing in Odessa Tx probably hasn’t even been to Odessa Tx. A one bed room apartment is going for over a $1000 a month, and a single wide trailer is costing in the $100000 range. A house the size of a storage building or shed is going for $120000 or higher. Yes the jobs are plentiful, but not all the people living in Odessa or Midland Tx works in the oilfield.